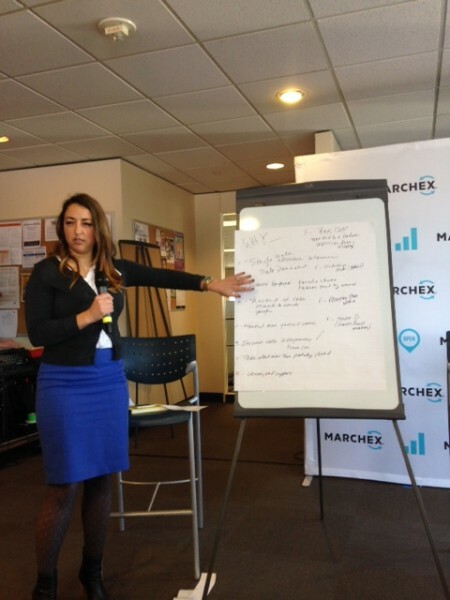 On March 16, In the midst of Women’s History Month, Marchex held the kick-off meeting of a new women’s professional development group called VOICEs (Value, Openness, Ideas, Connection, Empowerment, Support). 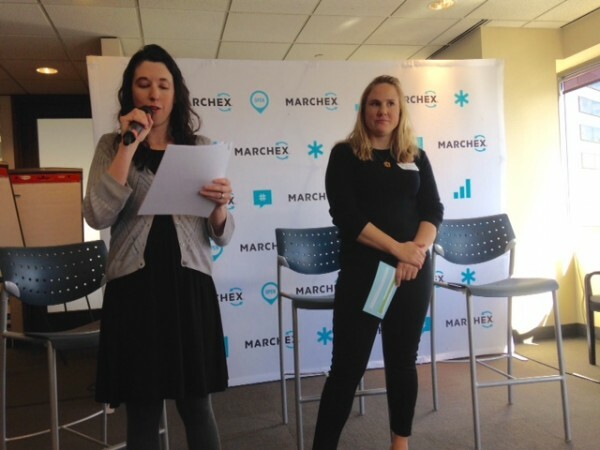 The founders of VOICEs opened up the meeting to everyone at Marchex – all genders, teams and levels were welcome to join. And join they did! With more than 60 women and men participating, the first meeting went off without a hitch. The group first heard from the creators, Diana Thomas and Terra Zarter, as well as one of the Executive Sponsors, Ethan Caldwell. 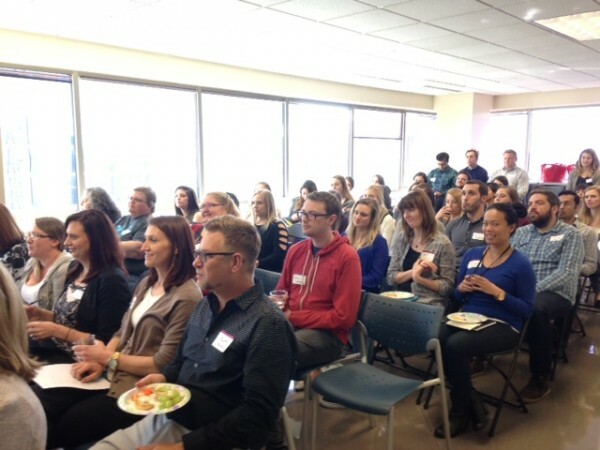 Energized and excited, everyone was then broken up into groups of about 8-10 and dispersed into separate meeting rooms. The topics of discussion were “why did you join VOICEs” and “what do you hope will come from VOICEs.” Many groups’ answers mirrored each other, and largely the consensus was that women need a place to feel comfortable talking about issues that they face in the workplace, a group for comradery and to ultimately feel empowered in their career. The meeting closed by holding a refreshing Q & A with the two other Executive Sponsors, Amy Whaley, VP of People Services and Carrie Grant, VP of Local Operations. We sat down with the two VOICEs creators, Diana Thomas and Terra Zarter, to discuss why they formed the group, what they hope it achieves and how they think the first meeting went. What was the genesis of VOICEs? Terra: I think it really started for me with discussions with my mentor, Amy Whaley, and especially after Anne Devereux-Mills, one of Marchex’s board members, came to the office and participated in the Marchex Leadership Speaker Series. Anne had started Parlay House, an organization in San Francisco that allows inspirational woman to gather together and discuss relevant topics, and I wanted something like that at Marchex. And while I was musing on the idea, I discovered that Diana was working on a similar plan. Diana: Yeah, I was speaking with Scott [Klein, Employee & Organizational Development Director] about starting a discussion with the women at Marchex. Two of my employees came to me, even before Anne did her talk, about the necessity of an organization like this in Marchex. I identified Carrie Grant as an executive sponsor, and that’s when I linked up with Terra. T: I wanted a place where women could build up women, a positive platform for networking and inspiring each other, building each other up. Women, unfortunately, can be very hard on one another, and I really wanted a forum where we could leave that behind, be open and supportive. There are some really amazing people who work here and I wanted that to shine through. D: I wanted to shine a light on women in leadership, especially for the younger employees. We have fantastic advocates for women at Marchex, I’ve had so much support from people like Pete [Christothoulou, CEO] and Todd [Wilson, VP, Operations], and I wanted all the employees to see that support. A lot of people might miss the great advocates we have here. And, at the same time, sometimes you’re the only woman in the room. That can be difficult, I’d love for it not to be, but it’s a reality. So I wanted that support, I wanted to create a group I wish I’d had when I started in my career. What were the major themes that came up in the first meeting? D: Awareness was huge. I don’t think people at Marchex perceive any intentional bias, there’s no one going out of their way to exclude women from anything, but bringing awareness to unintentional bias was great. It’s a healthy conversation to have. Have peer support, a community you can count on, all of that is incredibly valuable. At the end of the day, we’re all human beings and having a safe place to talk is a wonderful thing to have. T: The really cool thing about the first event was that nothing really surprised me. From the first board meeting, we came up with a really great group for the board, everything we discussed in the board meetings and then brought to the group were huge hits. It was a really nice feeling to know we weren’t off the mark in our original discussions, people were excited. Awareness, like Diana said, was huge. Another big topic was interview styles and tactics. That goes to the unintentional bias. We talked about what we’re doing with interviews, how we approach them, and how we can set more folks up to succeed by being aware. D: And it just started with one or two people at the first meeting taking the first step, being very open about their experiences and speaking to them. It was like a domino effect, from just those two people the entire group began to open up. What was the most surprising thing that you walked away with? T: There was no negativity; it was a completely positive discussion. Which is exactly what we wanted, not to dwell on negativity, we wanted to bring awareness to the things we can do. D: I was surprised by how energized everyone was. I think people were surprised the two hours we had scheduled for the first meeting flew by so quickly. But really it was the interest and excitement and confidence of all the attendees that really stuck with me. We were, of course, hoping for that, but it’s hard to expect it. And the men who participated, we figured we’d have a few, but they were fantastic. They had such positive contributions, they acknowledged issues of unintentional gender bias, of problems they saw, and that made everyone feel safe to take the discussions further. It made people free and honest. Which, again, is exactly what we were hoping. T: Yes, absolutely. It was very nice for this group to experience the openness of the upper management in the way that I have. I was surprised that I didn’t leave the first meeting wishing we had done something differently. It just clicked. And the discussions carried on to the next day. In the elevator, in the lunchroom. The energy and positivity surrounding what we had planned for, what we had discussed, we saw it through the meeting and into the next day and moving forward. What do you hope VOICEs will become in the future? D: We’re definitely still in the listening phase. We’re getting to know what this new entity is, we need to trust the organic nature of building this community, trust what people need and what Marchex needs, but we are still very much in the listening. But our hope is that it thrives, that it helps us all succeed. T: Yes, success is key. We want VOICEs to grow, to get more board members, new participants, that this becomes a force within the company. When we were just beginning we met with Anne to pick her brain and she said something that really stuck with me: If this group is a success, then we won’t need this group in the future. That doesn’t mean we will stop the discussion, but that as a whole, as a company and organization, this kind of group wouldn’t be a necessity.